It’s Friday and I haven’t exercised my brain lately. So today I am doing a Design Me challenge. FBI tile placement with a dexterity aspect! Piece of cake! If you have never checked out Boardgamizer, go do so right now! You just might be inspired for your next awesome game design. Manhunt is a tile (card) placement dexterity game for 2 to who knows how many players. Let’s say 8. So 2-8 players. 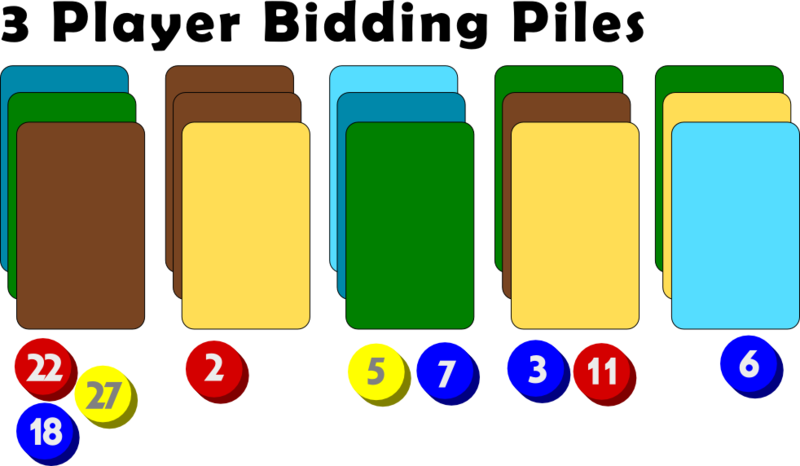 Each player is given an objective card at the beginning of the game. On each card are two goals. The first player to complete both goals will win this fast-paced fun and interactive game! Deal each player one Objective tile. This represents that player’s victory condition. Shuffle the City deck and place it face down near the edge of the table. Flip one tile face up and place it in the center of the table. Then flip two more tiles and place them face up next to the deck. On your turn you will either choose one of the two face up tiles OR you will draw a tile off the top of the deck. Then you will flip, drop, toss, or whatever you need to do to get the tile onto the table. However, you simply cannot place the card on the table. No matter where the tile lands it becomes part of the city. Some sample tiles. The lines that separate the colors represent roads. Some of the objectives require you to earn Manhunt tokens. 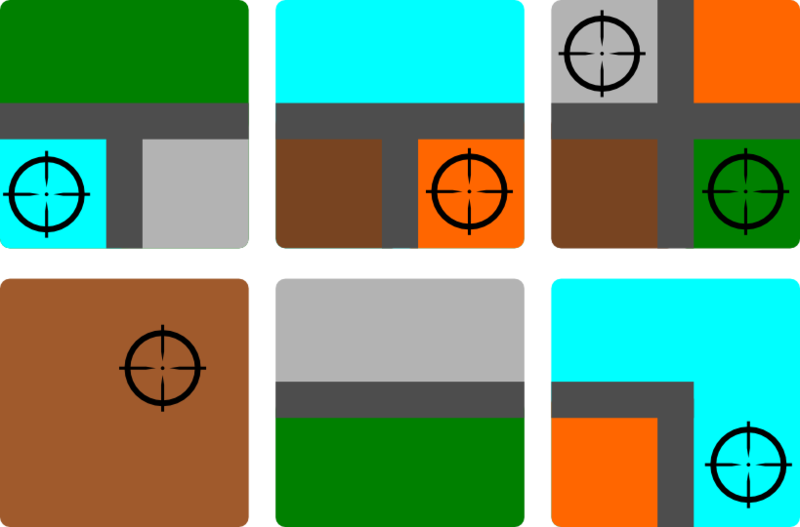 To earn a Manhunt token you you to get your tile to cover up a cross-hairs icon. For each icon that you cover you will earn 1 Manhunt token. 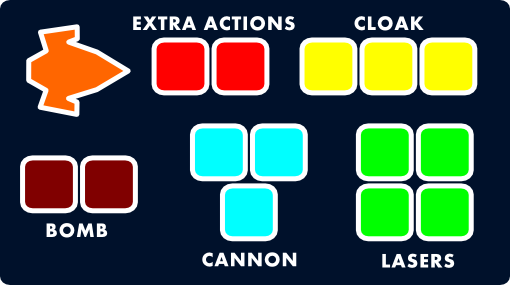 Some of the objectives require grouping colors together. So if you can get a group of four brown city sections together then you might meet your objective. Some objectives could be to get roads together. If you can get three road sections to line up you might meet your objective. When you complete an objective you should take an Objective token and place it onto your objective tile to indicate that the objective has been met. So using roads, city sections, and cross-hair symbols you can have a slew of different objectives to meet. The first player who can meet their objectives from their tile will be the winner. I have successfully exercised my mind and created a tile placement dexterity game that I think could be a fun 10-15 minute filler. I have not played Jason Tagmire’s Maximum Throwdown but I imagine this is similar to that. Sorry, Jason, if this is a rip-off of that. Or I suppose this is similar to FlowerFall. If you think a game like this could be fun, then I suggest you check out Maximum Throwdown or FlowerFall. Thanks for reading and don’t forget to exercise you designer mind! Ah… it’s an exciting day on Boards & Barley. Today is the first Design Me article of the year! What is a “Design Me” article? It is a design exercise. Like soccer players who run for practice to exercise their muscles, I think it is important for designers to exercise their brains. So every once in a while I choose a random theme/mechanic/victory condition and see if I can come up with a decent game design on a whim. Route Building + Space Colonization? I can do this! Note: for this design me I am changing the victory condition. Instead of solving a puzzle or mystery, the player who builds the best route will win. In Armada Galactica you are a galactic superpower trying to create a new trade route through whichever galaxy you are currently in. As a galactic superpower it is your job to make sure you are providing enough vacation spots for your population. The way to do that is to spread your empire throughout the galaxy. You can colonize a new location if it is within a certain location of your currently existing locations. But there are a few steps you must take. These include SCOUT, TERRAFORM, and then COLONIZE. On your turn you can also perform some research upgrades. Each planet or moon you colonize will begin with basic capabilities based on its characteristics. As you bring technology along your colonization route, those planets/moons will get better at allowing you to reach further and explore/colonize more distant locations. So the concept is to build a route from planet to planet by utilizing the characteristics of those planets to allow you to further colonize. The winner will be the person who has built the best route by the end of the game. A game of Armada Galactica is played until someone has placed their tenth colony token. To place a colony token, the desired planet/moon must be able to support enough population. 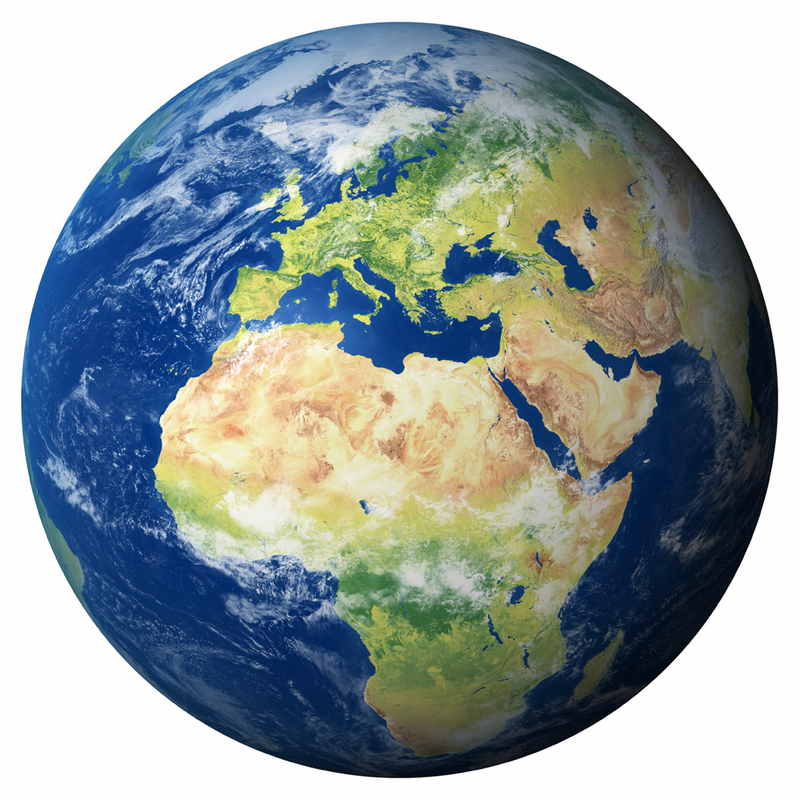 A planet/moon can support enough population if it has been terraformed correctly for the type of body it is. Players will each have a home planet (not dissimlar to Ascending Empires – I’m trying hard not to simply duplicate that game here – I feel I’m failing at that). The board is composed of a grid of planets/moons. Each location will have randomly received a planet token, so the grid is never the same from game to game. These planets are the rarest in the game. But they are the easiest to colonize. Without the need for terraforming these are the hot spots that you’ll want to go after! These planets were once Earth-like, so it will take some work to get them back to that state. That means you’ll have to devote some effort to terraforming. But these are still relatively easy to colonize. These are planets that possess water under layers of ice or rock. Terraforming won’t be enough on planets like these. You’ll need specialized research that can warm the planet from the inside to sustain life on it’s surface. These planets are basically covered in water. So terraforming isn’t exactly possible. Instead you’ll have to haul a serious amount of infrastructure to the planet to essentially create boats/structures large enough to sustain a large population while floating on the water. If your terraforming research isn’t very good you may want to build a network out of these bad boys. Those are the four main types of celestial bodies you will encounter while attempting to grasp galactic supremacy. Yet the goal is not simply to build all ten of your colonies. Scoring is also based on the populations you can sustain. On your turn you can choose either EXPLORE, RESEARCH, or POPULATE as your main action. The EXPLORE action allows you to use your three rockets to scout the nearby planets. All of you network must be in a continuous line, so it’s important to look ahead and see what’s coming. Also during the EXPLORE action you can transport equipment to the newly selected planet. This could be infrastructure, terraforming equipment, or research scientists. The RESEARCH action allows you to utilize scientists that you have placed on your planets to increase that planet’s capabilities. For example, if a planet has a high exploratory research level, then if the rockets are launched from that planet they can travel twice as far, which would allow you to spread your network over a wider area. If your planet has great earth-like resources, and if you increase its terraforming capabilities, then it can become a hub for your terraforming infrastructure to expand to new locations. Research will play a key role in the game and you will want to maximize the capabilities of your planets. The POPULATE action allows you to colonize a new location. This can only be done if that location has met the colonizability standards. Players will place a colony token on the new location. This action can also be used to increase the population in your existing colonies. This is a key to victory since population is the main scoring category. On your turn, in addition to the main action you can also perform a secondary action. These are like dumbed down versions of EXPLORE, RESEARCH, and POPULATE. But they can allow you to take advantage of certain planetary characteristics if you really wanted to accomplish something awesome on your turn. Once a player has placed their tenth colony, all players will have one final turn, including that player. At the end of the game players will total their population cubes and their colony tokens. Each colony token counts as three population cubes. So players could earn a maximum of 30 points from their colonies alone. Research levels and infrastructure will also be scored on a low-level basis. The idea behind awarding points for those is because they are what set the population limit for a player. I expect final scores to be in the 70-90 range. I had a lot of fun coming up with this design despite not creating any graphics or images for it. That’s a rare thing. I really like this idea and I think I might move forward with it. I am still on the lookout for the other game that I’d like to put on The Game Crafter this year. If this comes together nicely maybe it will be that game. Do you have any thoughts about this design? Are there any obvious problems? Are there areas where I really fell short? Don’t forget to exercise your brains! Action Point Allowance to crusade the moon and beat a bad guy! I can do this! In the game Moon Rattler you are in command of one of several military space fleets sent from Earth to destroy the moon. Little did we humans know that the moon is actually a giant rattlesnake. It has laid some eggs and it’s getting really feisty. We humans need to prevent those babies from hatching. It’s time to save the world! But these weapons cannot be used freely. Each player will have to charge their weapons or obtain bombs using their action points. Let’s dig in a little deeper. Players will be flying their ship around the circle in clockwise fashion. At each location they will have 4 action points to use. In any turn the player may save two of their unused points for a later turn of their choosing. So on any given turn a player will have 4-6 action points available. 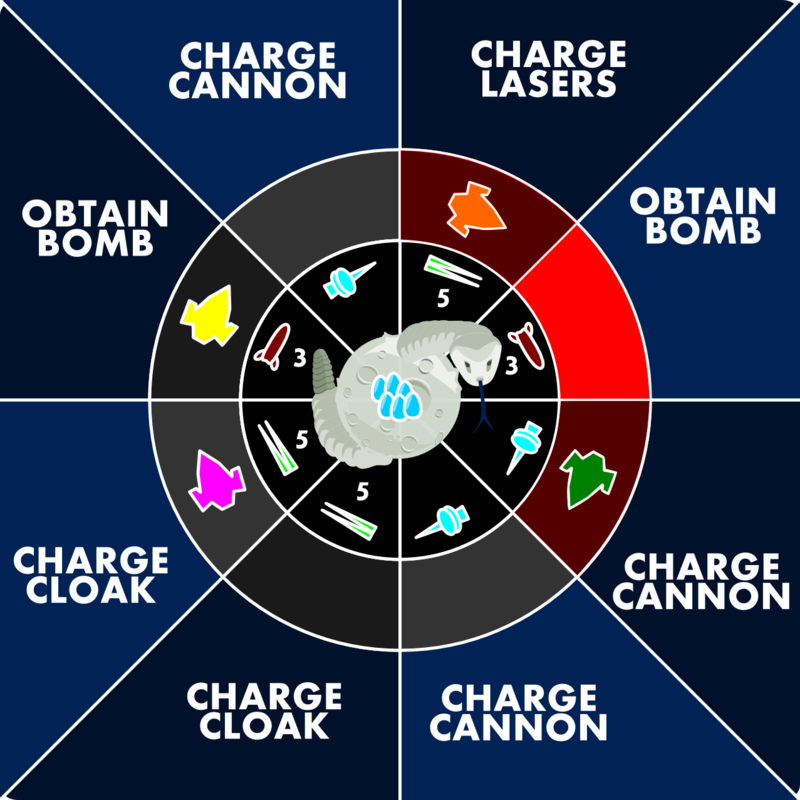 Therefore a ship can hold 2 bombs, a charge of 3 for their cannon, a charge of 3 for their cloak, and a charge of 4 for their lasers. Let’s pretend we are the orange player. First of all, we are in a red region. The three red regions near the Moon Rattler’s head are the regions where the rattler can strike you. In the dark red regions you lose 1 AP if you are not cloaked. In the bright red region you lose 2 AP if you are not cloaked. Using the cloaking device does not cost AP, but the cubes must be discarded from your player mat. So the orange player is in a region with CHARGE LASERS. The region also shows that only lasers can be used to attack in that region. So the orange player is basically deciding if the want to charge or attack with their lasers. The green player is in the same situation in the image above with the exception that they are either charging their cannon or using their cannon to attack the eggs. They are also in a red region, so hopefully they had a cloaking cube to discard. Here’s the other thing. Players may stay in a region as long as they like. Their ships will fly only when they use AP to move around the rondel. A player may use any number of AP to move 1 spot per AP around the rondel. On a turn a player will use AP in any order. So let’s imagine we are the orange player again. We might have a bomb on board. So we could spend 1 AP to move into the bright red region at the head. Then we could use 1 AP to drop a bomb (and earn 5 points), then we could spend 2 AP to move off the head and onto the CHARGE CANNON region. That would be a great turn if we did not have any more cloaking cubes. At the start of the game, an appropriate number of health cubes should be placed on the octants of the board. For example, the head region should begin with 3. Each time these regions are attacked, the attacking player will remove one of the cubes per attack. These regions can still be attacked but are only worth 1 point each. The game will end when all cubes have been removed. My Thoughts: I think this could be an interesting concept. I like the balance of using AP to charge versus to attack. With the rondel in the game it makes it important where you are located. I think I may mock this one up and give it a try. What do you think about the design for Moon Rattler? What would you have come up with for the design based on the Boardgamizer criteria? Any thoughts about my design? Thanks for reading! And don’t forget to exercise your brain by doing design exercises like this! Have a great weekend.